It is hard for me to express how much I love this book. As a kid, I only knew it from glimpses of the movie version that I stole while playing at my friend Tony's house, the friend who had HBO. I remember only something about a black rabbit at the end, but I don't want to know more. I'm reading it now, out loud, to my seven and nine year old kids, usually near the wood stove now that it's colder, and it's such a great final hour of the day that I'm usually ready to be tucked into bed myself after a chapter or two. If you don't know it, it's about rabbits, and they talk, but it's not a kids book, really--it's written with enough sophistication and there is enough subtlety of character here that most of today's popular young adult fiction looks laughably simple in comparison. And that's what's odd about it: I dare say it could be a difficult read for someone not used to challenging themselves much beyond Harry Potter or The Hunger Games, but, at the same time, my kids hang on every word, and it's not like they're especially special or anything. And I just spoke to another student last week who first heard the book read to her by her dad when she was seven, and it's her favorite book, too. But anyway, it's wonderful. The brave young rabbit Hazel, leading his small band to friendlier land, the descriptions of the land itself, the violence and fear that makes up the life of these small animals--it's one of the most affecting novels I've picked up in a long time. "Disunion," a series on the Civil War at The New York Times blog The Opinionator . I used to have a teacher who used to brag to us students that his Civil War final exam was so difficult that . . something, I don't really remember, but I know it was bad. We never found out because, luckily, he had some kind of health thing that made him retire before we got that far. Ever since, the Civil War has always hung there for me, like a war all my buddies went off to without me. There has been some guilt. But Disunion, a series of blog entries that focus on big and little stories of the war, is helping me to face this dark period of my personal history. It's full of details that feel quaint now: generals too timid to pursue an enemy to take a crucial railway station, the effect on mortality caused by a simple change in the shape of bullets. I still don't have a clear overall picture of the war, and would fail that test for sure today if forced to, but this blog gives me enough of the tiny stories that I would be able to bluff my way through an essay or two. The first six seconds of this video of Allen Ginsberg walking down the street. The video lasts a little over five minutes, a silent clip of home-video showing Allen Ginsberg and Jack Kerouac walking down a Manhattan street in 1959, but all I care about are those first six seconds. There's something infinitely cool about the way he swings his arms, his lazy smile, his whole beat poet swagger. I don't love it as much as I love hearing him read his poem "America," but there is a lot of that poem in those few slow-motion seconds of film. 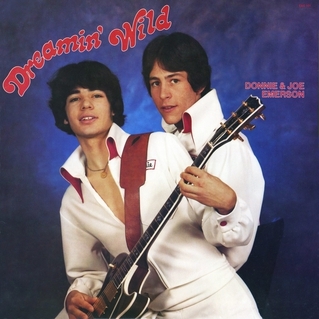 My Last.fm scobbles might say differently, but it feels like the only song I've really heard for the past few weeks now is the mellow and naive R&B of Donnie & Joe Emerson's "Baby." The story of how their one album was recorded, forgotten for decades, and then re-discovered in a second-hand shop and given new life is so sad and weird it's funny, but there is nothing funny about this song. When I was young, I thought Life, A User's Manual would teach me how to live and Suicide a User's Manual would teach me how to die. 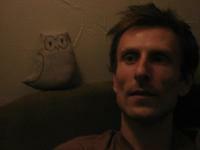 I have spent three years and three months abroad. I prefer to look to my left. It continues in that broken style for another 100 pages or so, and before long I started writing my own version, adding a line or two every few days as they occurred to me. Any book that gets you to pick up a pen has to have some merit, I think. I also can't stop thinking about "Marathon Man," a New Yorker article about Kip Litton, a dentist from Detroit who has recorded impressive finishes in dozens of marathons all over the country--all without, apparently, actually running them. Even with the entire online running world obsessed with catching him (see the 200+ page thread about him at Letsrun.com), no one has figured out how he cheats, although it appears that some of the races he has done well in did not actually exist. 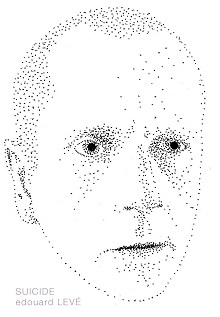 Mark Singer interviews Litton himself, who denies it all, and it is all you can do not to try to reach through the pages of the magazine and try to shake some sense into the guy. Now that school has started back up, the best time for me to listen to music is usually when I'm in the kitchen making a weeknight dinner. And lately, apart from the new Frank Ocean, I'm back listening to Air again. No matter what time of day it is, the weather, my state of mind, it always feels like the right time to listen to their album Moon Safari, a record that can make an evening making quesadillas or curry, or a drive to Target to pick up paper towels feel like a scene from a movie worth watching. A Restless Transplant. Guy quits his job, buys a van and starts driving up and down the west coast, surfing skateboarding, losing himself on lost. His blog documents his travels with lonely pictures of fog-shrouded coastal roads in northern California and Mexican beach communities, and they leave me wondering if maybe he has figured something out. Most surfers make me wonder that, actually. They seem to touch some kind of wisdom that eludes mere golfers and joggers. My friend Tracy Row told me about this recipe that is supposed to recreate Chipotle's barbacoa burritos, and finally, this weekend, it is going to happen. It has to. Or at least I will get myself to Chipotle. I remember solid red when you close your eyes to the sun. I remember the pale green tint of Coca-Cola bottles. I remember French kissing and figuring out it must have something to do with the tongue since there isn't anything else in the mouth except teeth. And now I remember how I miss teaching Composition because assigning students to write their own "I Remember" led to the creation a lot of my all-time favorite student work. Will Oldham has always been one of my favorite enigmatic singer-songwriters even though I once convinced a bunch of friends to go see him with me in Bloomington and he put on one of the most awkward live shows I've ever seen. Except for Cat Power, which was so much worse. His new book is pretty much all I want to read right now. I envy his gypsy lifestyle, friends in every city, no mailing address of his own. I would have to get rid of a lot of stuff to do that, though, and I would miss my family, and the stuff, too, probably. This simple article about writing has me making sentences in my head and then playing with them as a new pastime when I am driving around the city in silence or standing in the yard staring at my stacks of firewood. Months later, I am still returning to this collection of Leanne Shapton's drizzly and intimate watercolors. 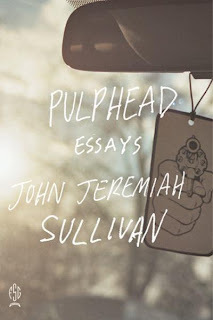 For months, Amazon.com has not shut up to me about John Jeremiah Sullivan's book of essays, Pulphead. Every visit to that site has shoved it in my face: the casual Windows Paint-made script of its cover page, the washed-out, gritty sentimentality of the photograph. Somehow, Amazon’s algorithms, or whatever you call them, had determined that it was the perfect book for me, the one I was destined to meet and fall in love with, the book that would make me happy. I don't even remember ordering the book itself, but yesterday, it came in the mail, and on the same day I got a notice from the library that it had come in for me after I’d placed a hold notice for it. True story. I don’t remember doing either, but here the book was, so I took a day off from reading George Eliot and started into the first essay, “Upon the Rock," a pretty hysterical account of driving a 29’ RV to a Christian-rock festival in remote Pennsylvania. When he does this, gets to come across as though he’s not a mean guy, he’s just letting these people speak in their own voices. But he’s choosing which quotations to include, and his choices usually create humor at their expense. Sullivan comes across as a person of complicated faith here. One interesting passage for me is his recollection of a time he calls “his Jesus phase” in high school, something he remembers when he sees that aging Christian rock band Petra has taken the stage. It’s an interesting story, and it feels more like he’s pondering a subject for a future essay rather than treating it fully here, which is either sloppy writing or an interesting glimpse inside the narrator’s relationship to his subject. I am feeling an urge now to get a Lilly grant so that I can rent an RV and hit festivals all summer and meet people. I should get started on that. "Here is how to hand a glass deer a beetle." from "Glass Deer." Oh, this guy and his poems. 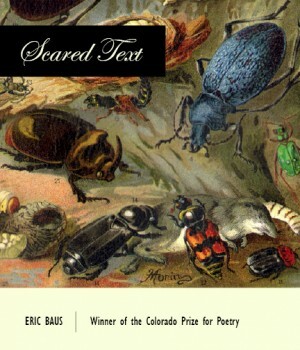 The newly released Scared Text is Eric Baus's third book and maybe my favorite and I can't even begin to speak about it. It is full of lines like this, lines that seem to make such perfect sense to themselves. "Oh," I think, "so that's how you hand a glass deer a beetle. I need to remember this." There are several kings in a single fox. They haunt one another's brows. They hunt their brains for a broken stinger. A crown of hornets fleeces their phlox. from "Hornet Fleece." I like the way "hunt" echoes "haunt" here. It makes me think the voice is mis-hearing or mis-reporting something, but doing it with confidence. That confidence helps make the all the fantastic action here seem plausible and even likely, which is pretty magical. Baus and I actually went to the same high school, not at the same time, but we had the same teachers, both experienced the passionate maelstrom of Mr. Rusk's English class. How nice to know that our town can give birth to such, I don't know, difference, maybe. It is more than a little inspiring to me. ". . . they rode out on the round dais of the earth which alone was dark and no light to it and which carried their figures and bore them up into the swarming stars so that they rode not under them but among them and they rode at once like something jaunty and circumspect, like thieves newly loosed in that dark electric, like young thieves in a glowing orchard, loosely jacketed against the cold and ten thousand worlds for the choosing." All the Pretty Horses (30). As much as I think about re-reading The Savage Detectives, it's All the Pretty Horses that I seem to open up and browse the most. I open it and pretty soon I am reading it out loud, usually some passage like this, with stars in it, glum cowboys nearby. Right now I wonder about the repetition of "thieves" here. Is it awkward? Could he have chosen a different word the second time? Sometimes I like to think that it's evidence that the narrator is trying again, trying to get it right, but that doesn't really fit with the tone of tragic omniscience the narrator usually carries in this book. It's not the voice of a consciousness that wouldn't get it right the first time. But anyway, I'm glad to be back in this book again. Someday I want to outfit one of these with some shelves, make it an ice-reading shack. 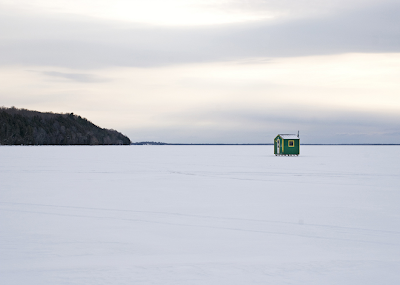 I'll drag it out on Burt Lake and start spending some nice alone time there. When sportsmen knock on the door and ask if I'm getting any bites, if that is indeed what they normally say in these situations, I will nod and tell them "you have no idea." If they ask why there isn't a hole in the floor of my shack, I don't know what I'll do. Maybe read them some Kenneth Koch. Or nod, give them an unnerving smile, and answer "exactly."